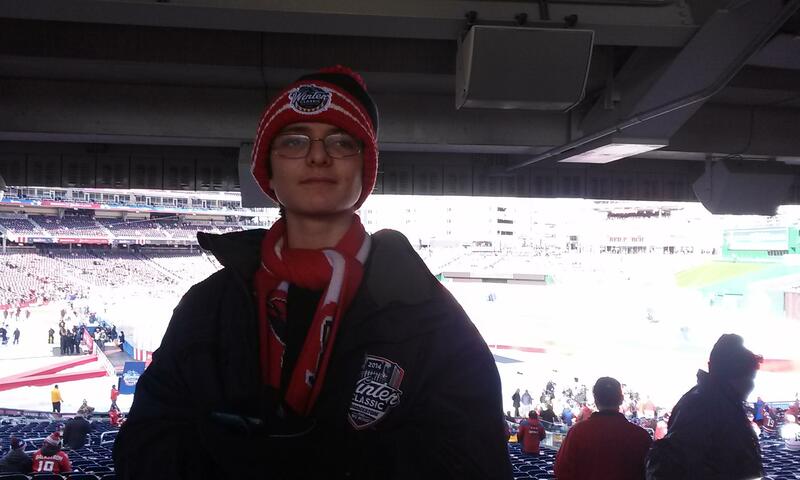 Ryan at the NHL Winter Classic in Washington, D.C. — one of the many things that has happened since my last post. Much has happened since my last post. Christmas happened. New Year’s happened. Another NHL Winter Classic happened. Several trips to the doctor, and even one to the ER, happened (everyone’s fine). Heck, even Jim Harbaugh to Michigan happened. Each could be its own post (well maybe not the Harbaugh thing, but still, yay! Jim Harbaugh! At Michigan! ), but that’s not what I want to write about this morning, on my way to the office for the first time in more than two weeks. Ryan had a couple of hockey games over break with his town-based middle school team, including one last night. I didn’t notice before we arrived at the rink that the opponent was the house-league team he played for last year. I recognized several of the kids and greeted a few of their parents. That experience was a mixed bag, as Ryan struggled to fit in and even soured on the idea of playing after some issues in the locker room arose. That feels like a lifetime ago as he presently attacks each game and practice with enthusiasm, works on individual skills at home, and even has made friends with several boys on the team. As I looked across the rink at the benches last night, I noticed a surprise. Ryan’s old peewee coach was behind the bench for the house league. He last coached Ryan two years ago in what was, to date, Ryan’s most enjoyable hockey experience. Coach G helped out when issues arose last year, and he told me after the game last night that part of the reason he is back behind the bench is to prevent any similar issues to what Ryan experienced from happening this year. As the game ended, the teams lined up for handshakes. I thought to keep an eye on Ryan. I was curious whether he would recognize Coach G, or vice versa. Ryan was the last player through the line. Coach G appeared to be looking away when they shook hands and turned to head off the ice. That’s when the little thing, which is, of course a Not Little Thing, happened. 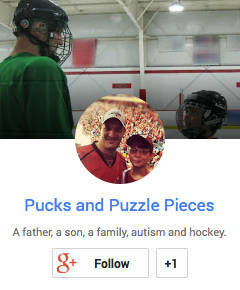 Instead of skating off the ice, Ryan stopped and turned back to his old coach, tapping him on the shoulder. I saw the look of surprise register on Coach G’s face, and then he threw his hands up and embraced Ryan in a big hug. I didn’t blame him for not recognizing Ryan, who is probably at least eight inches taller than when he last played for Coach G. Instead, I reveled in Ryan seeking out that contact, even when the moment appeared it would pass. Recognition of familiar faces does not come easily for Ryan. I don’t know if it’s a form of face blindness, or if perhaps he’s just unsure of himself, but he often questions the identity of people we assume he’s familiar with, seeking reassurance that they are indeed the people he suspects. I have learned that lack of outward signs of recognition does not mean Ryan is oblivious, it’s just that the interactions are tricky. Watching that handshake line, I would have predicted Ryan would skate off without interacting with his old coach, unless the latter initiated the contact. I prepared to ask him about it when he got off the ice. Instead, not only did he recognize Coach G., he sought him out and initiated the interaction. I don’t have to tell you, dear reader, how huge that is. In our postgame conversation, Coach G recognized it, too. “He’s really opened up,” he told me. It put a perfect capper on what was really an excellent and memorable winter break. That’s awesome. I’ve heard about and witnessed my Roc seeing people out of context (like our next door neighbor subbing in the school library) and he seems unsure of himself. I’ve also wondered if it was face blindness or his uncertainty. Go Ryan!